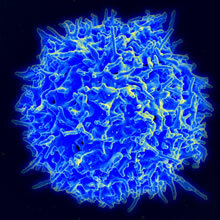 Mechanical regulation of T-cell biology is one of the topics of the consortium's first symposium on Feb. 28. A new research partnership between Emory University and the Georgia Institute of Technology will apply the principles of engineering to study the immune system and develop new therapies that can improve the immune response to diseases. The Georgia ImmunoEngineering Consortium (GIEC) will bring together engineers, physicians, chemists, physicists, computational scientists, immunologists and clinical investigators to better understand how the immune system works and how to precisely modulate it to target challenging diseases. The research teams will focus on cancer, infectious diseases, autoimmune and inflammatory disorders (diabetes, lupus, multiple sclerosis, arthritis, fibrosis, asthma, inflammatory bowel disease, etc. ), and areas of regenerative medicine including transplantation, bone and cartilage repair, and treatments for spinal cord injuries. "The immune system and its multi-faceted role in human health and disease form the cornerstone of medical research, says Ignacio Sanz, MD, co-chair of the consortium steering committee. Sanz is Mason I. Lowance Chair of Allergy and Immunology and director of the Lowance Center of Human Immunology at Emory, director of rheumatology in the Department of Medicine in Emory School of Medicine, and a Georgia Research Alliance Eminent Scholar. "This consortium not only combines the expertise of researchers throughout a variety of disciplines focused on the human immune response, but also reflects an increasing focus on engineering technologies and informatics in improving the diagnosis and treatment of challenging diseases." "By joining our immense strengths in immunology and bioengineering, we aspire to become an international leader in immunoengineering science; develop new technologies for prevention, rapid diagnosis, and treatment of immune-related disorders and train the next generation of physicians and engineers in this cutting edge research," says Krishnendu Roy, PhD, co-chair of the consortium steering committee, director of the Center for ImmunoEngineering in the Parker H. Petit Institute for Bioengineering and Bioscience at Georgia Tech and Carol Ann and David D. Flanagan professor of biomedical engineering in the Wallace H. Coulter Department of Biomedical Engineering at Georgia Tech and Emory University. Immunoengineering is the application of engineering tools and principles to better understand and monitor our immune system in health and in diseases. This knowledge is then used to develop more effective vaccines and therapies against a wide range of diseases like cancer, HIV, diabetes, multiple sclerosis, arthritis etc. and also to improve tissue regeneration, wound healing and transplantation, explain Sanz and Roy. "Game-changing innovation and world-class scholarship occur at the boundaries of fields of study where collaborators bring different perspectives to challenging problems," says Stephen E. Cross, executive vice president for research at Georgia Tech. "This is the essence of the successful 17-year partnership between engineering and science at Georgia Tech, and medical science and clinical practice at Emory." Existing centers and departments that will collaborate within the new consortium include the Center for ImmunoEngineering at Georgia Tech as well as the Emory Vaccine Center, Lowance Center for Human Immunology, Departments of Medicine, Microbiology and Immunology, Hematology and Oncology, and Pathology and Laboratory Medicine in Emory School of Medicine, the Emory-Children’s Pediatric Research Center, and Winship Cancer Institute, among others. The consortium has partnered with the Georgia Research Alliance (GRA), a nonprofit organization that expands research and commercialization capacity in Georgia’s universities to launch new companies, create high-value jobs and transform lives. "The Georgia ImmunoEngineering Consortium is a unique academic collaboration that represents strong opportunities to align our state’s extensive university research base with targeted life sciences industry development in Georgia," says C. Michael Cassidy, GRA president and CEO. "GRA looks forward to seeing the new discoveries and commercial opportunities that result from this partnership." The consortium will also collaborate with research partners at the Centers for Disease Control and Prevention (CDC) and partners at various colleges and universities around Georgia, the United States, and around the world. "Using engineering approaches to help unlock the biology of the immune system opens the door for exciting new discoveries that can alter human disease," says David S. Stephens MD, vice president for research in Emory’s Woodruff Health Sciences Center, chair of the Department of Medicine in Emory University School of Medicine, and a member of the consortium steering committee. Additional members of the steering committee from Georgia Tech include M.G. Finn and Susan Thomas, and from Emory include Rafi Ahmed and Edmund K. (Ned) Waller. Feb. 28, 2014, 7 a.m. – 5 p.m.